A 2004 Cessna 208 Caravan. The Cessna 208 Caravan is fixed gear, single turboprop engine regional airliner, which has been built by Cessna since 1984. It typically seats nine passengers with a single person crew. 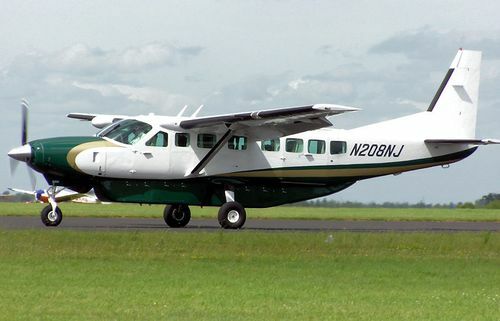 A larger version, the Cessna 208B Grand Caravan, seats up to 14 passengers. The aircraft is also used for cargo feederliner operations. This page lists all films that feature a variation of the Cessna 208 Caravan. Pages in category "Cessna 208 Caravan"
This page was last modified on 26 August 2011, at 10:17.